ITEMS FROM MCCOY'S ISLANDER LINE ARE DIFFICULT TO FIND! THIS LISTING IS FOR A SPOON REST IN THE PRETTY CREAMY COLOR WITH SHINY GLAZE. 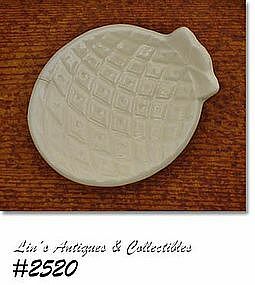 SHAPED LIKE A PINEAPPLE, MEASURES 4 1/4" LONG (AT LONGEST), 3 1/4" DIAMETER. MARKED ON BOTTOM: 1716, MCCOY, LANCASTER COLONY (MARK), USA. HAS NO "USE" EVIDENCE -- NO CHIPS, CRACKS, OR CRAZING. DOES HAVE A 1/4" PRODUCTION STRESS ON RIM. PRETTY AND USEFUL ITEM!